Young Chung-Yee Health Centre is a medical and dental clinic on campus that provides general medical consultations and dental care services to members of CityU. Fees may vary depending on your student type. Minor students who wish to use the dental clinic are required to complete and return to the dental clinic a consent form and a health questionnaire. Healthcare services in Hong Kong are comprehensive, highly professional and people-centred. There are 12 private hospitals and more than 42 public hospitals in Hong Kong, which makes it easy to find polyclinics in the community that provide primary care services, including dentistry. There are 3 hospitals in the neighbourhood of Kowloon Tong: Hong Kong Baptist Hospital, Caritas Medical Centre and Queen Elizabeth Hospital – all of which provide medical and healthcare services to the public. Fees and charges vary, depending on the medical conditions and treatments. 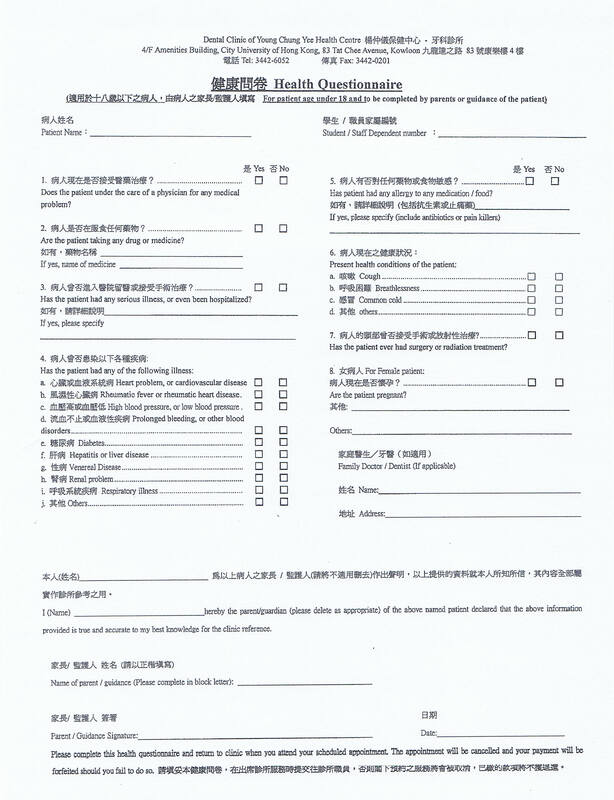 All hospitals and polyclinics in Hong Kong require patients to present and register their Hong Kong Identity Cards or passports upon admission. Students who hold a valid Hong Kong Identity Card may use the public health services at regular residential rates. All fees and charges incurred from public and private medical services shall be borne by the students at their own expense. You are thus strongly advised to purchase health and medical insurance that will meet your specific needs. For a list of public and private hospitals near the University, please see Emergency Contacts.